It’s a seafaring safari! Watch humpback whales, Stellar sea lions, Dahl’s porpoise, orcas and harbor seals up-close on this small-group experience. Your tour sets off on a safari vessel small-group whale-watching adventure through the waterways of Stephens Passage. A naturalist guide will lead you through hands-on activities that support areas of research such as invasive species monitoring or plankton sampling, humpback whale identification and marine mammal observations. You will experience the science behind the scenery while observing the antics and behaviors of Juneau’s most prominent marine residents, all the while benefiting local research organizations. • Whale sightings: See humpback whales, Stellar sea lions, Dahl’s porpoise, orcas and harbor seals. • Hands-on activities: Learn about whale research through hands on activities such as invasive species monitoring, plankton sampling, and/or whale identification and monitoring. 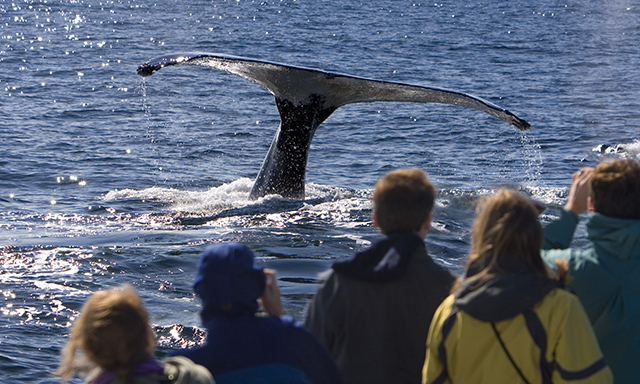 • Small-Group Experience: Get up-close and personal with this exclusive tour on a smaller sized whale-watching vessel. • Not intended for guests with limited mobility. • Provide a 48 hour notice for mobility/accessibility needs. • Guests are eligible to enter to win prizes in tour operator's annual Capture Juneau Photo Contest. • Each person will receive a $100 cash refund form the tour operator at the conclusion of the tour if a whale is not sighted on the trip.